Pleasanta Goodwoman. That’s a character name that Isabella came up with when she was around 10, for one of her short stories. I can’t remember the story, but the name stuck with me. I imagine that someone with that name would be good. A good person who never says the wrong thing, or speaks too loudly or unkindly, or causes the rocking of any boats with opinions or confrontation. If she were a color, she would be taupe. Not red-brown fire, bold bronze or chocolatey passion… just a consistent, uncontroversial, mid-value tan. 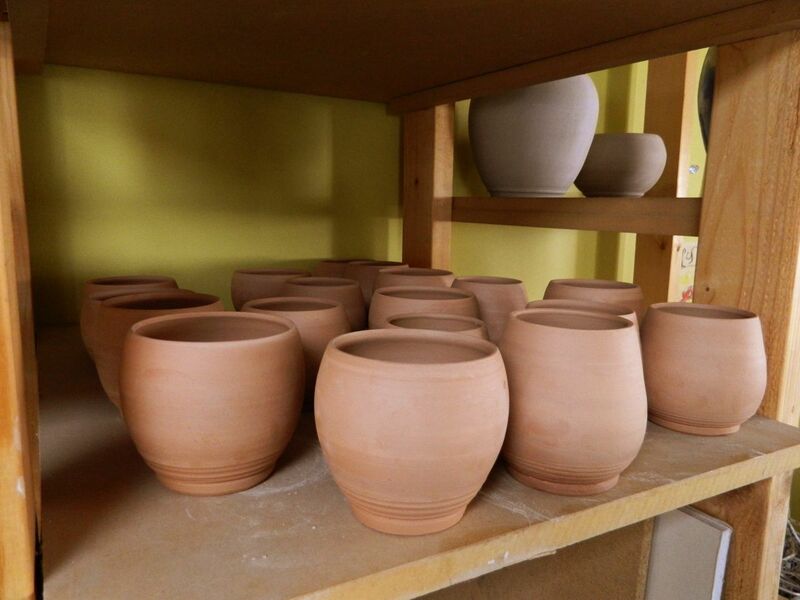 Being a professional potter is not a safe line of work; safe meaning: predictable, conventional. A place to be 40 hrs a week, where a corporate or human someone tells you what to do. One that yields a reliable income, benefits, paid days off, and retirement. Pleasanta Goodwoman would never be a potter. No, the physical demands and creative responsibility would be too much for her. Plus, it’s messy. Downright dirty, in fact, as working with dirt tends to be. Sometimes I wonder if I’ve made the right career choice, this one that involves so much happiness but also struggle. A career that would never be possible without the unwavering support from people who love me because they have to (thanks, family! ), and people who buy my work. The good thing is, whatever happens is up to me. The bad thing is, whatever happens is up to me. But it always comes down to the same choice, one I imagine all of us in creative fields make: financial security & convention vs. passion. Doing what you love. The thing you are willing to suffer for, but would suffer more if you weren’t doing. Pleasanta would certainly choose the former. I imagine Pleasanta would have a much cleaner house then mine, too, which at the moment is in a state of wreckage because I’ve neglected all other responsibilities save for the occasional feeding of my child in order to reach my studio goals. Wanna have a peek? Here’s how things are looking right now. 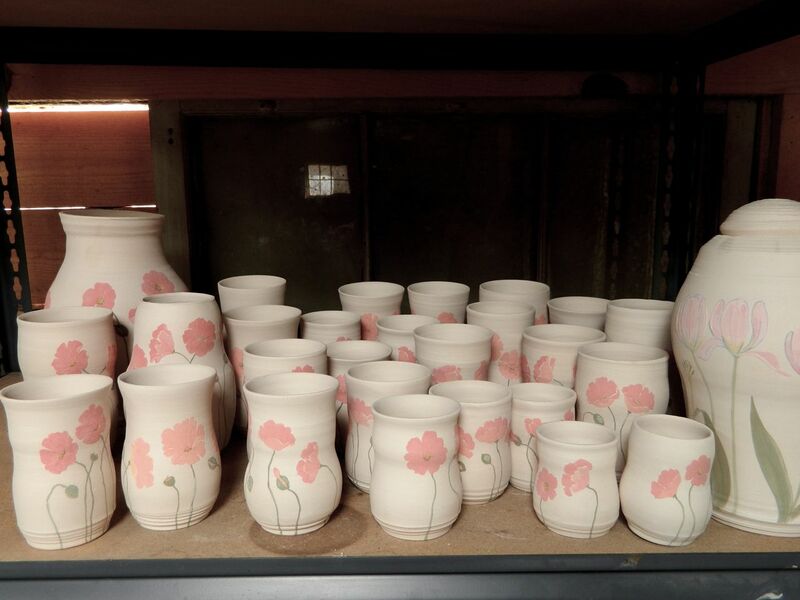 All these poppy cups and the two jars are ready to be glazed. Why did I make so many of those? More cup/bowls! These will be painted with blossom designs to hopefully turn out like this. 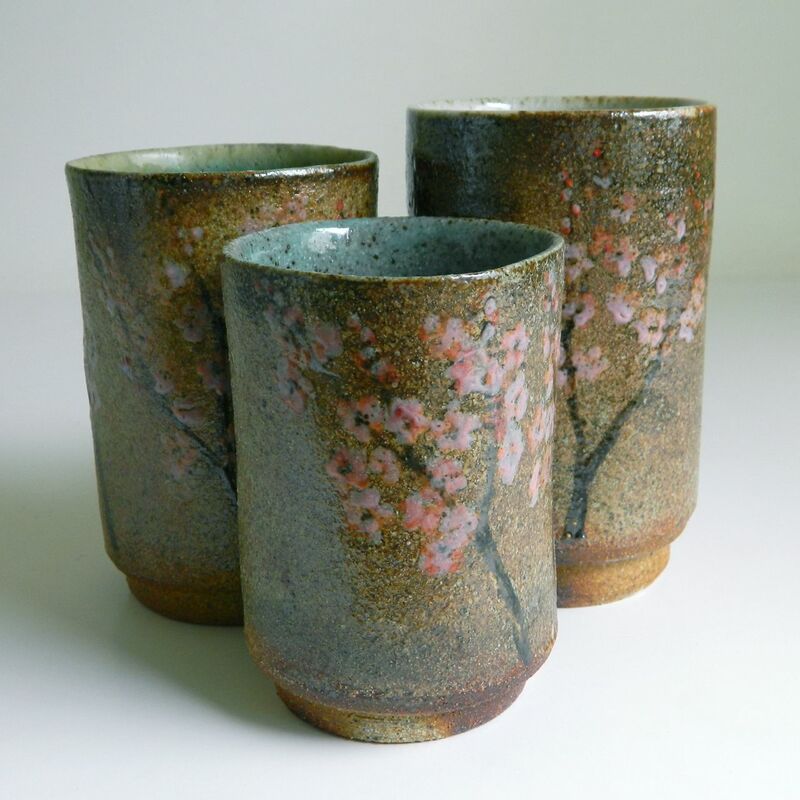 Wait, even more cups…. 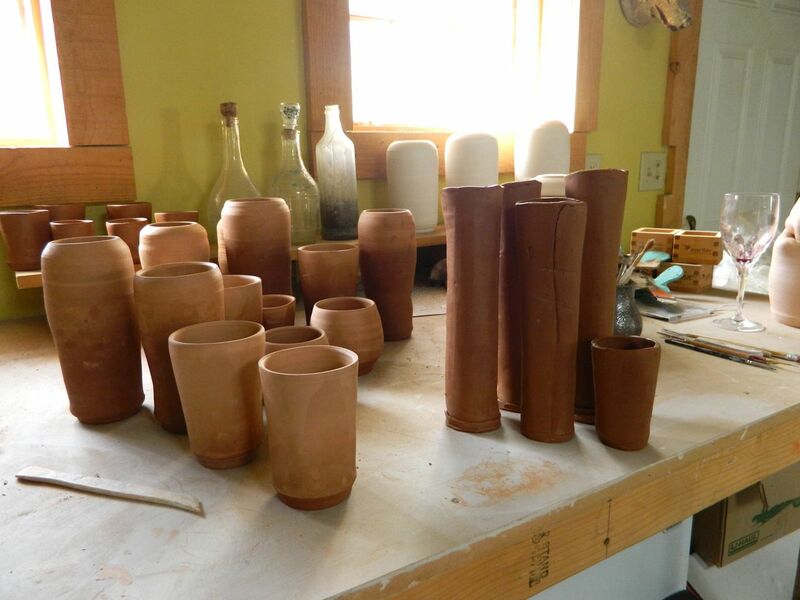 A friend also requested an 8″-9″ vase so naturally I had to make 12. Oh, there’s that wine glass (I’ve discovered that a straw in the bottle works just fine). If the wood-fire goddesses are smiling upon me, some of those will look like this. Man, what a mess! 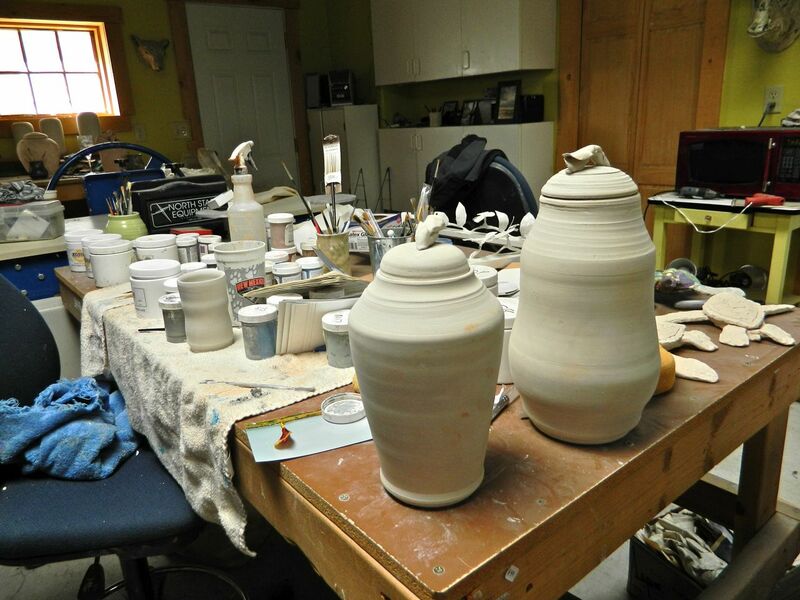 Here are some Poppy urns that need to be painted. I’m making these for Funeria. I’m pretty happy with the new lid style, a sculpted flower. I wonder if I’ll still like it when they’re finished? Let’s take a closer look. Is it too O’Keeffey-vaginal? 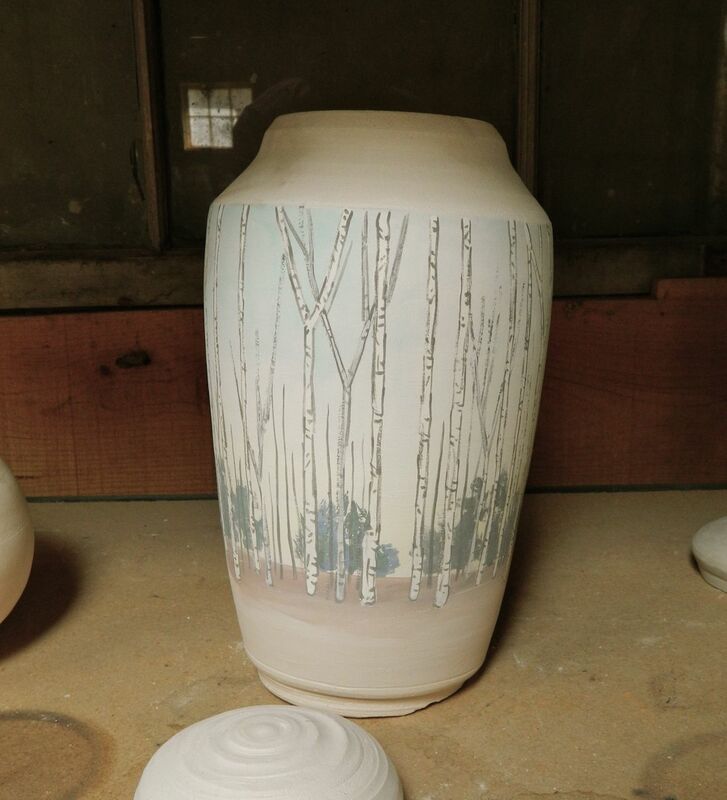 Wouldn’t this Aspen urn have been lovely? Had the foot not blown off because I didn’t let it dry long enough? Darn. Off to the garden it goes…. I’ve been thinking a lot over the past few weeks about what I am and what I’m not. The kind of self-analysis that sometimes dips a toe into self-disappointment (a gentler word than loathing). Those times when I’m just not proud of myself. Impatience. Hurtful words. Taking people or places or my life for granted. Biotchy. Despite my best intentions. 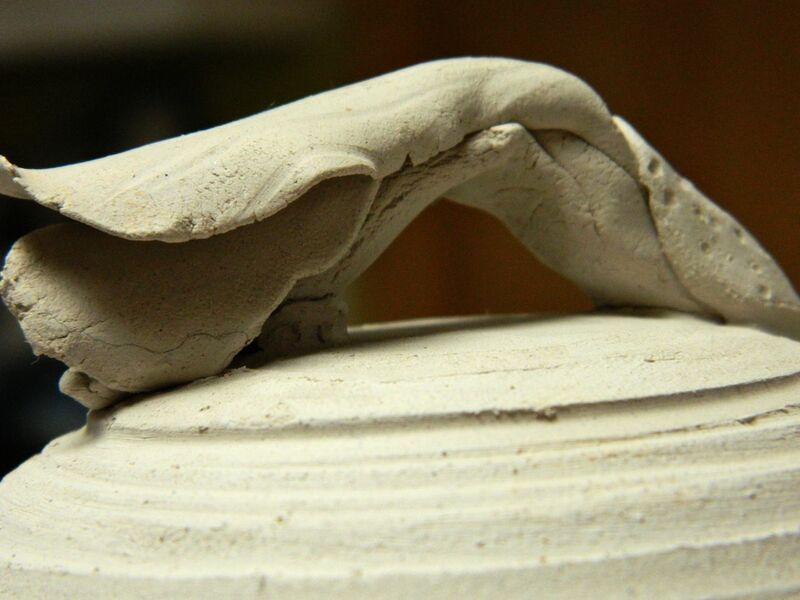 The nice thing about clay is that it tends to absorb all of that while you work — the good, the bad, and the ugly — and give back something beautiful in return. Mostly I’m really happy with the choices I’ve made, how I spend my time and the company I keep, the brokering of love in all its manifestations: art, children, gardens, family, lovers, expensive dogs. And for those times when I feel like a half-blind idiot fumbling around just trying to get it right, I remember my favorite [paraphrased] Walt Whitman quote, Do I contradict myself? Yes, but I am large, I contain multitudes. Absolute unworthiness is part of the perfection. Passion and risk go hand in hand. I’m not Pleasanta Goodwoman. I FEEL ANOTHER CONTEST COMING ON!!! something to do with the wood-fire and the nature of imperfection, but I’m still formulating it. So, stay tuned for your chance to. win. big. Ahh… the goodwife syndrome. I assume that you know that the Puritan ladies who arrived on the Mayflower in 1621 were known as Goodwife or “Goody” so-and-so. Mrs. was not in favor then, so they were just known as “Goody Parris” – a minister’s wife and mother of one of the afflicted girls in Salem Village or “Goody Corey” wife of Giles Corey, the only man pressed to death because he wouldn’t confess to witchcraft. My favorite “Goody” though, was “Goody Badwife” in the Halloween episode of The Simpsons in 1997 – this was also the one where Bart’s head was replaced with that of a fly. Probably my favorite Simpson’s episode ever. I have a bit of a “thing” for the whole Salem fiasco. My girl and I spent part of our honeymoon in Salem. It was Halloween. we went to the rituals, and then a walk with the covens through town. It was an incredible night! Perfect way to spend Halloween, sounds like! Now I have to visit Salem…. I would have thought Pleasanta Goodwomam would be a frontier woman, arduously and methodically claiming the land for her family. She probably would have completely understood your freedom of life away from the corporate world, and if she had any appreciation for beauty, would have loved what you do. Can’t wait to see the “after’ pictures of the undecorated stuff! Your conjecture of PG is a good one, Guap! I guess that American Can-Do frontierswoman spot is already occupied in my consciousness by the name Ingalls. Ma. Pa. Laura. There they were, breakin’ the sod and East Coast tradition. But I like that… and thanks for the forward-look to the firing. I can’t wait to see how they look, either! Favorite line: “If she were a color, she would be taupe.” I think I’ll steal that concept and inject it into a poem! There’s never a bad time to look at your life, what you wanted and didn’t, what you became and what was lost by becoming what you are. In the end you’ll always come around to realizing you are where you are supposed to be right now. There’s something comforting in that. As for Pleasanta Goodwoman, she sounds like she probably is more wild than you think…because she sounds like she might be wearing a scarlet letter somewhere in a Hawthorne novel. By the way, loved the Grey Poupon Youtube ad on the blog. You’ll probably get a quarter since I clicked on it. Wow, Michael, what a very eloquent comment. Thanks. And you’re right, I suppose, we’re always where we should be. But would, like, Bush say the same thing? I dunno. Who put Grey Poupon on my blog?? I never see these ad things… they sneak up every so often. I think I have to pay extra for an “ad-free” blog, but normally it’s not a problem. I think it’s the nature of this post, actually. Someone thought it could use a little mustard. Thanks for stopping by, longhorns! Yeah, studio work is a lot of fun, doesn’t feel like ‘work’ at all! Pleasanta Goodwoman sounds B-O-R-I-N-G. You are so so so much more interesting, creative, and talented than someone who works in accounting and brings a turkey sandwich for lunch every day. No apologies necessary for the mailing…I’m happy to be included as a recipient of one of your generous and gorgeous gifts! I love your blog and am sorry I’ve never posted… Always the lurker, never the worker But I want to comment on this one because it was hard for me to read this portrayal of Goodwoman while you also expressed self-disappointment! My idea of good-woman is someone who is creative, vibrant, fulfilling her dreams AND with doubts and fears. In short, you — and hopefully most of us. Okay, I realize my Goodwoman does not have the first name of Pleasanta, but let’s give her good (plus bad) sister a name. There’s a contest. 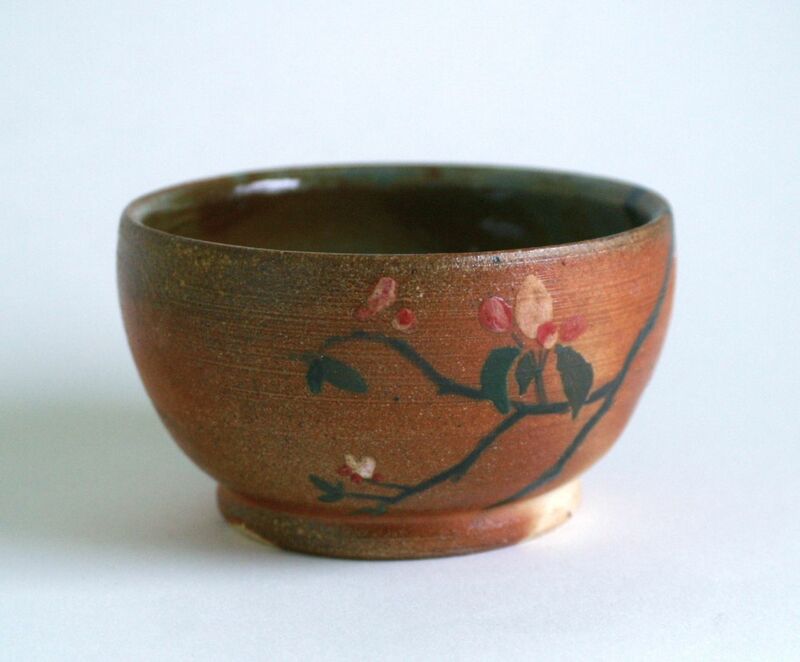 The photos of your work reveal beautiful pottery. 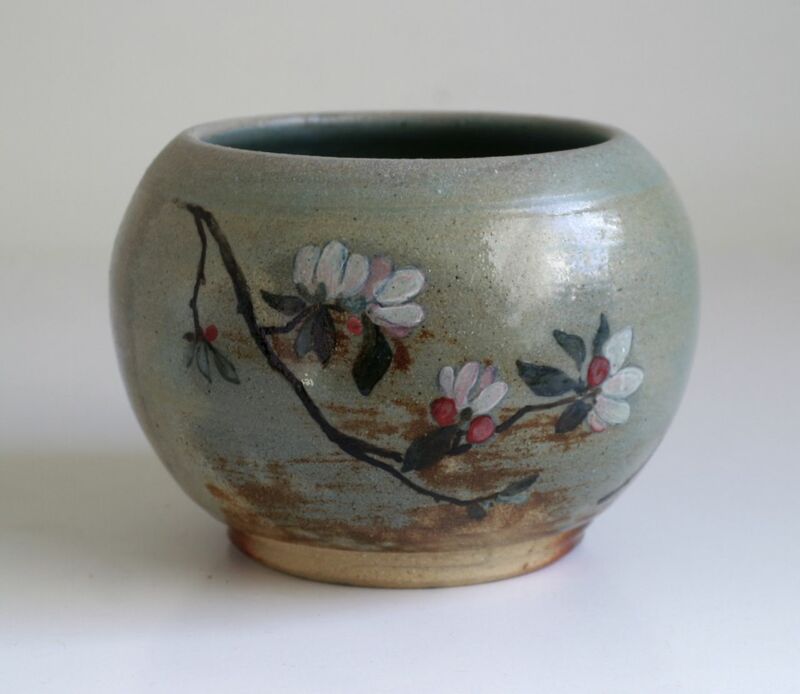 Best wishes for a fantastic firing experience! P.s. pardon me? But where’s the grey poupon? I didn’t see that. My beautiful pot arrived today! I am so glad I won, and hope your dog continues to avoid bowel obstructing balls or ball shaped bowel obstructions. Give her a couple of pats from this dog lover. Thank you again for the pot (still feeling a bit guilty about accepting it, though)! I am ready for another contest althought first I have to spend time sending out the Thank You Cards that you have designed for our El Salvador Delegation! It fills this mother’s heart with comfort and joy that you will never be taupe let alone grey. I LOVE the work that you are doing and hope you make another aspen vaze, dahling. Aw, where would I be without you? WHAT would I be 😉 Thanks for the contrant support….